Sipajhar College Recruitment 2018 (Sept) – Assistant Professor :- Sipajhar College Darrang has issued a job notification recently. According to the the Sipajhar College Recruitment 2018 September Applications are invited from eligible candidates for filling up the vacant positions of Assistant professor in various departments/subjects. The details of the vacancy can be found in the following section. 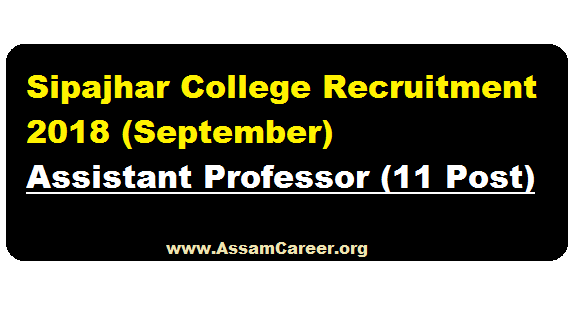 In this section, we will discuss in details about the recruitment of Assistant Professor Posts under Sipajhar College Recruitment 2018 September with vacancy details, eligibility criteria, salary with other details and requirement. The candidates must have cleared the NET/SLET/SET. Candidates having Ph.D. degree in accordance with UGC Regulations 2009, shall be exempted from NET/SLET/ SET. A relaxation of 5% may be provided to the Ph.D. degree holders, who have obtained their Masters Degree prior to September 19, 1991. Age Limit : 38 years as on the 1st day of the year 2018 with relaxation of 5 years for SC/ST candidates. Applications must reach the undersigned on or before 12th of October, 2018. Note : The candidates must have PRC and must know the local language. This advertisement has been done in pursuance of the DHE’s permission letter No.DHE/CE/ Roster/122/2017/79-A dated 15.09.2018.